Charles Leonard "Charlie" Brown Jr. Celebrating the life of Charles Leonard "Charlie" Brown Jr.
Be the first to share your favorite memory, photo or story of Charles Leonard. This memorial page is dedicated for family, friends and future generations to celebrate the life of their loved one. 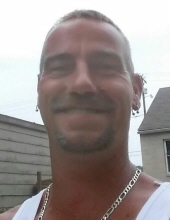 Obituary for Charles Leonard "Charlie" Brown Jr.
A Taylorsville resident, Mr. Charles Leonard “Charlie” Brown Jr., age 42, passed away Wednesday, November 27, 2018 at his residence. He was born March 26, 1976 in Tampa, Florida to the late Charles Leonard and Ella Lorraine Cumptson Brown Sr. Charlie was a handyman and helped anyone he could. Along with his parents, he was preceded in death by his mother that raised him, Laura Bricker, and 2 sisters, Rene and Rhonda. He is survived by his wife, Joyce Goodlett Brown, his step son, Daniel Tindall, his father that raised him, Edward Bricker of Bradenton, FL., 4 brothers, Clifford (Michelle) Brown of Taylorsville, Steve Moore, Tom (Debbie) Bricker, both of Bradenton, FL., Scott Haas of Sarasota, FL., 2 sisters, Kathy (Shane) Moss and Helen (Bob) Devereaux of Bradenton, FL., and his step grandson, Hunter Tindall. Cremation was chosen by the family. A memorial service will be held at a later date. The Greenwell-Houghlin Funeral Home of Taylorsville is in charge of arrangements. To send flowers or a remembrance gift to the family of Charles Leonard "Charlie" Brown Jr., please visit our Tribute Store. "Email Address" would like to share the life celebration of Charles Leonard "Charlie" Brown Jr.. Click on the "link" to go to share a favorite memory or leave a condolence message for the family.